Twenty years ago, Philip Platzman and Allen Mills, Jr. at Bell Laboratories proposed that a gamma-ray laser could be made from a Bose-Einstein condensate (BEC) of positronium, the simplest atom made of both matter and antimatter (1). That was a year before a BEC of any kind of atom was available in any laboratory. Today, BECs have been made of 13 different elements, four of which are available in laboratories of the Joint Quantum Institute (JQI) (2), and JQI theorists have turned their attention to prospects for a positronium gamma-ray laser. In a study published this week in Physical Review A (3), they report detailed calculations of the dynamics of a positronium BEC. This work is the first to account for effects of collisions between different positronium species. These collisions put important constraints on gamma-ray laser operation. Discovered in 1933, antimatter is a deep, pervasive feature of the world of elementary particles, and it has a growing number of applications. For example, about 2 million positron emission tomography (PET) medical imaging scans are performed in the USA each year. PET employs the antiparticle of the electron, the positron, that is emitted by radioactive elements which can be attached to biologically active molecules that target specific sites of the body. When a positron is emitted, it quickly binds to an electron in the surrounding medium, forming a positronium atom (denoted Ps). Within a microsecond, the Ps atom will spontaneously self-annihilate at a random time, turning all of its mass into pure energy as described by Einstein’s famous equation, E = mc2. This energy usually comes in the form of two gamma rays with energies of 511 kiloelectronvolts (keV), a highly penetrating form of radiation to which the human body is transparent. Platzman’s and Mills’ gamma-ray laser proposal involves generating coherent emission of these 511 keV photons by persuading a large number of Ps atoms to commit suicide at the same time, thus generating an intense gamma-ray pulse. Ps lives less than a microsecond after it is formed, but that is a long enough for it to demonstrate the distinctive properties of an atom. It is bound by the electric attraction between positron and electron, just as the hydrogen atom is bound by the attraction between the proton and the electron. Figure 2 shows the spatial distribution of electron and positron density in Ps as given by the solution of the Schroedinger equation. The sharp central cusp is the place where the electron and positron meet, and annihilate. The electron density there is about four times the average density of the conduction electrons in copper wire. The electron and positron each has an intrinsic spin of ½ (in units of the reduced Planck constant). Thus, according to quantum mechanics, Ps can have a spin of 0 or 1. This turns out to be a critical element of the gamma-ray laser scheme. The 511 keV photons are only emitted by the spin-0 states of Ps, and this takes place within about 0.1 nanosecond after a spin-0 state is formed. The spin-1 states, on the other hand, last for about 0.1 microsecond, and only decay by emission of three gamma rays (for reasons of symmetry). What we will get here is a process, stimulated annihilation, that is analogous to the stimulated radiation process at the heart of laser operation. Thus, when a pulsed beam of positrons is directed into a material, a random assortment of Ps states is created; the spin-0 states annihilate within the nanosecond, and the spin-1 states live for another nanosecond. During this latter time, the spin-1 states serve as an energy storage medium for the gamma ray laser: if they are switched into spin-0 states, which constitutes the active gain medium that generates the fast pulse of 511 keV gamma rays. Part of the JQI theorists’ work involves the modelling of the most likely switch for this process, a pulse of far-infrared radiation. They find several switching sequences that approach the optimal condition of switching all spin-1 states to spin-0 states in a time short compared to the annihilation lifetime. Platzman and Mills pointed out that the Bose-Einstein condensate is a form of “enabling technology” for the Ps gamma-ray laser. This is because its low temperature and high phase-space density make coherent stimulated emission possible: in an ordinary thermal gas of Ps, the Doppler shifts of the atoms would suppress lasing action. This introduces another degree of complexity, which is explored in detail for the first time by the JQI team. A Ps BEC will only form when a threshold density of Ps is attained. That density depends upon the temperature of the Ps, but it is likely to be in the range of 1018 Ps atoms per cubic centimeter, which is about 3% of the density of ordinary air. At that density, collisions between Ps atoms occur frequently, and state-changing collisions are of particular concern. On the one hand, two spin-1 Ps atoms can collide to form two spin-0 atoms; this process limits the density of the energy storage medium. On the other hand, two spin-0 Ps atoms can collide to form two spin-1 atoms; this process limits the density of the active gain medium. Using first-principles quantum theory, the JQI team has explored the time evolution of a Ps BEC containing various mixtures of spin-0 and spin-1 Ps atoms, and has found that there is a critical density of Ps, above which collision processes quickly destroy the internal coherence of the gas. 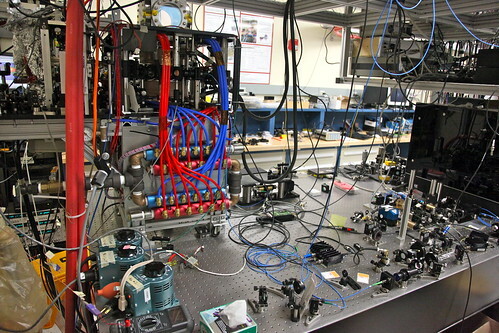 (2) The Joint Quantum Institute is operated jointly by the National Institute of Standards and Technology in Gaithersburg, MD and the University of Maryland in College Park.